UP VDO Admit card / Call letter 2016 is required for all the candidates who want to appear for the written examination / interview. 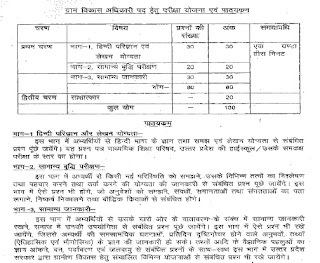 Uttar Pradesh Subordinate Service Selection Commission (UPSSSC) is in the process of conducting the written examination for Village Development Officer (VDO) / Gram Vikas Adhikari under Advt. No. 3/Exam/2016. Through this exam and interview, a total of 3133 posts are going to be filled. The objective type written test is to be organized on 05 June 2016 in 15 districts. UP VDO Exam Admit card can be downloaded now only through online mode i.e. through website. UPSSSC had released the admit card for UP Gram Vikas Adhikari (VDO) cycle race and physical efficiency test. You can download them from following link. Download the Admit Card for the Village Development Officer Cycle Race & Physical Efficiency Examination 2016 (Advt. No. 3-Exam/2016. The admit cards are available at upsssc.gov.in and you will be able to download them through us. We will be updating you with latest news and updates regarding this recruitment. The written examination of Gram Vikas Adhikari is going to be objective type pen and paper based examination. Uttar Pradesh Subordinate Service Selection Commission will be organizing this examination at following district's centres in Uttar Pradesh. In the question paper, four options are shown with a question of which one is the correct answer and it should be marked on the sheet. The test carry 80 marks while interview is of 20 marks. Questions are to be asked from Candidates have to mark their answers in the OMR Sheet to be given at the centre. 1 hours and 30 minutes time is give to solve paper. 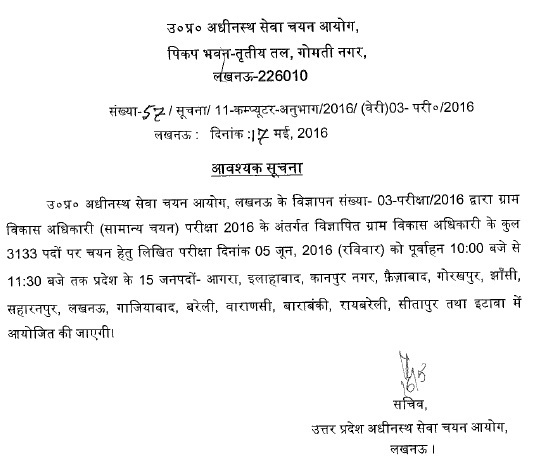 The written test for UP VDO / Gram Vikas Adhikari posts is to be organized in June 2016. 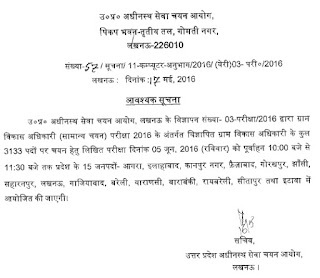 The admit card of UP VDO Exam is going to be available at upsssc.gov.in around 7-10 days before examination. It is mandatory for each candidate to bring this UP VDO admit card and one photo ID proof at the test centre as their entry will not be allowed without them. Those who score enough marks will be called for interview. UP VDO Interview call letters will be released for that. We will let you know when the hall tickets got released. You have to enter your registration number and date of birth and select gender to download it. You have to enter the personal details as exactly same as entered in UPSSSC Application Form and click on the "Download Admit card" button. Your UP Gram Vikas Adhikari Admit card will be showing after that and you have to take the print.